In 2006, Jean Luc Thunevin, better known for his numerous successful estates in St. Emilion like Valandraud, purchased a little known Pomerol property, Chateau Ratouin. Jean Luc Thunevin renamed the estate to honor the father of his long time partner and wife, Murielle Andraud, Le Clos du Beau Pere, which can be translated into father in law. The tiny vineyard of Le Clos Beau Pere is planted to 85% Merlot and 15% Cabernet Franc. The Right Bank estate consists of just 2 hectares of vines. However, Jean Luc Thunevin has an arrangement with another Pomerol vineyard owner to rent and farm his land, which allows Thunevin to include those grapes into the wine of Le Clos du Beau Pere. The majority of vineyard of Le Clos du Beau Pere has a terroir of gravel and sand based soils. However, there is a smaller portion of their vineyard has vines that are planted in terroir with more clay in the soil.. The vines are placed close to Chateau Bellegrave, due west of highway 89 in the Bourgneuf sector. The vines are at a very good age, as many of their Merlot vines are more than 40 years of age for the Merlot, with some vines being older than that. The Cabernet Franc vines are younger, as they are closer to an average of 20 years of age. To produce the wine of Le Clos du Beau Pere, vinification takes place in traditional, temperature controlled cement vats. Malolactic fermentation takes place in barrel. The wine is aged in 100% new, French oak barrels for between 12 and 14 months before bottling. The production is quite small less than 1,000 cases of wine are produced from Le Clos du Beau Pere per vintage. Le Clos du Beau Pere needs some time before it can be enjoyed. 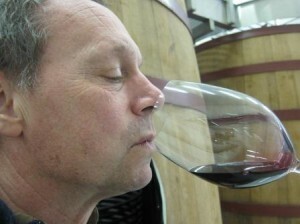 Young vintages can be decanted for an average of 1 hour or more. This allows the wine to soften and open its perfume. Older vintages might need very little decanting, just enough to remove the sediment. Le Clos du Beau Pere is usually better with at least 3-4 years of bottle age. Of course that can vary slightly, depending on the vintage character. Le Clos du Beau Pere offers its best drinking and should reach peak maturity between 4-12 years of age after the vintage. Le Clos Beau Pere is best served at 15.5 degrees Celsius, 60 degrees Fahrenheit. The cool, almost cellar temperature gives the wine more freshness and lift. Le Clos Beau Pere is best served with all types of classic meat dishes, veal, pork, beef, lamb, duck, game, roast chicken, roasted, braised and grilled dishes. Le Clos Beau Pere is also good with Asian dishes, hearty fish courses like tuna, mushrooms and pasta. This wine is all about the smoky black cherries and vanilla bean aromas. Medium bodied with curvy textured plums, cherries, cocoa and dusty tannins resound in the finish. Dark in color with vanilla, smoke and black cherries in the nose and plums and milk chocolate in the finish, the wine is soft, forward and willing. You can enjoy this on release. Medium bodied, slightly strict, especially for Pomerol, red plum filled wine is ready for prime time drinking with an hour or so of air. This is not a wine I'd age for long term development. One of the best values in Pomerol today. Produced by Jean Luc Thunevin, the wine serves up fresh, black plum, mocha, earth and espresso. Medium bodied, round and reasonably open. If you like your wines young, you can enjoy this in its youth. Else, this should be better with a few years of bottle age. Opulent, lush, forward style of Pomerol with perhaps a bit too much oak. But it's hard not to like all the plush, chocolate covered black cherries, fresh plums, earth and smoke. It's a good value for Pomerol, which is hard to find these days.